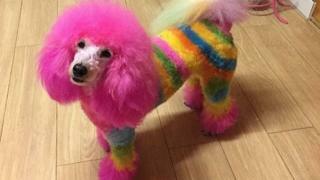 Extreme dog grooming: Harmless fun or threat to pets? The rise of "extreme dog pampering" puts the welfare of pets in jeopardy and "sends out an extremely worrying message", charities have warned.Pets can be "frightened and distressed" by treatments like facials and "pawdicures" offered at an increasing number of "dog spas", the RSPCA said.And despite the growth of the industry, it remains totally unregulated. A dog spa told the BBC its treatments were "harmless fun" as long as the pet was "happy and freely compliant".Daniela Forshaw, who offers "creative grooming" in Burnham-on-Crouch, Essex, said it was far more concerning that "most dogs are not groomed enough", causing infections, overgrown nails and "severe matting". According to the groomers' trade body the Pet Industry Federation (PIF), dog spas meet the demand from some owners for the "humanisation" of their pets, while the Kennel Club believes the surge in interest is in part because more of us are plumping for pooches over more demanding additions to the household.A spokesman said people were "increasingly viewing their pets as an alternative to children and are choosing to spend more money and attention on them". One owner, Vicky Allender, 34, said she was "totally unashamed" to spend about "I've done pastel colours, bright colours, multi-colours, feather extensions, little gems - what's the problem?" she said. Ms Allender even believes these makeovers put a spring in the step of Fred, one of her two chihuahuas. "When he has a creative groom, people notice him more. He puts his tail up and struts down the road. It's great human interaction and I've seen him gain so much more confidence. "For Ms Forshaw, what she is offering is simply "a few harmless fashion trends", although she said that dogs' fur should only be coloured by a "qualified, professionally trained groomer", with products that have been "formulated to use safely on animals". Not all spas have the same ethos.Carol Shaw, who runs The Dog Spa in Penzance, Cornwall, won't dye fur.She said: "Our focus is on the wellbeing of the pet. "The alternative treatments that we offer include foaming avocado and cucumber facials, pawdicures and massage, as we feel that's quite beneficial to the dog, obviously if the dog enjoys it." An RSPCA spokesperson said the extreme pampering of pets "sends out an extremely worrying message that they could be viewed as novelty accessories rather than as intelligent, sentient animals". "Even if a dye is marketed as 'pet friendly', we would strongly advise against it," said the charity, which offers advice on how to choose a groomer. A spokesperson from the Kennel Club said: "If extreme pampering becomes more normalised then there is a risk that animals will start being seen as accessories, which could lead to their welfare being jeopardised. "Its verdict was backed by Paula Boyden, the veterinary director at the Dogs Trust, the UK's largest dog welfare charity. "Grooming must be for the dog's needs," she said. "It is important that dog owners and groomers remember that dogs are not fashion accessories to have the latest trend used on them."